PT Fortuna Informatika Nusantara Jl. Cengkeh 16 No. 27 Kota, Jakarta. 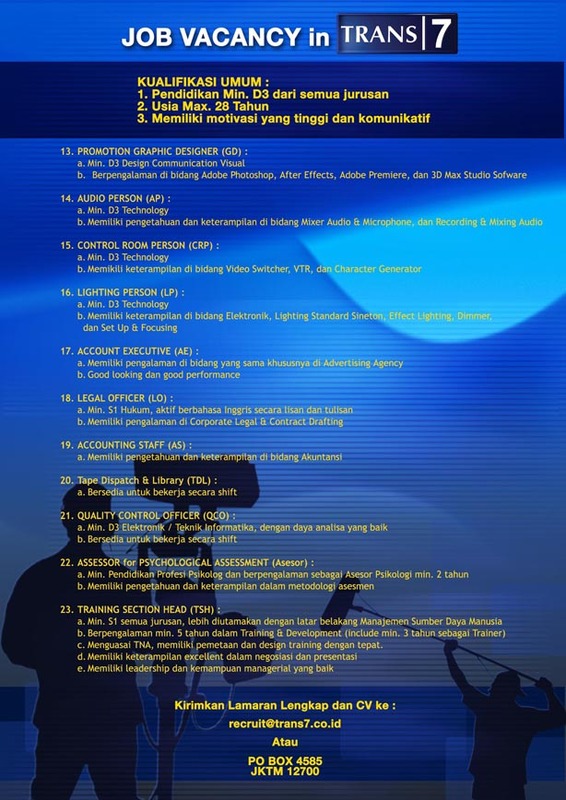 Bagi yang berminat, bisa kirim CV jefri@fortun.co.id (tulis posisinya pada subject). literacy, communication skill, team work, English . computer literacy, english proficiency. .
Hanya pelamar yg memenuhhi kualifikasi yg akan dipanggil. – Age 28 – 40, Bachelor or Master Degree in Business Administration and/or another related university degree. – Min. 3-5 years experience. – Good working knowledge of modern telecommunication systems (telephone, fax, email, internet and its software). – Well organized, independent, trustworthy, analytical, time management and administrative skills, good communicator and have good networking in Health and Public sector. Conceive, build-up and maintain the electronic literature data-base of the project. Extend its use to the other projects in the health sector. Transfer technology to the Center for Health Policy Analysis and Development in the context of Knowledge Management development of the Ministry of Health. Participate in the development of a capacity building program to improve the policy-making process in the Ministry of Health in the context of decentralization. § Maintain close cooperation and relation with other GTZ health projects and relevant institutions (counterparts, GTZ Jakarta, German Embassy, etc). § Organize visitor program in connection with field trip to pilot regions. § Prepare list of workshop, seminars, training and meeting for input of project’s report. § Organize meetings, workshops and seminars as required. § Follow up the project monitoring system. § Assist Principal Advisor and Team Leader on administration tasks, including prepare minutes of meeting for both internal and external meeting. § Select systematically the classification and adequate keyword list for literature, project documents and media other than books collection (Videocassette, CD, etc) and update them regularly. § Updating and maintain all libraries data and documentation. § Support and assist by finding and storing the required literature. Do not apply if you don’t meet the requirements. The incumbent should be a Master degree or Bachelor Degree in Mathematics and Statistics, Marketing Management, Economical Development Studies. Skills and knowledge in research (methodology, data processing using SPSS), data reporting and brand management (brand building, awareness, and activation) are prerequisites. Lamaran dilengkapi dengan Riwayat Hidup, Fotocopi Ijazah (*), transkrip nilai dan Surat Keterangan Dokter serta Pas Foto ukuran 4×6 (2 lembar) . 2. Kirimkan lamaran melalui email atau Pos ke alamat yang tertera dibawah ini. 3. Diutamakan memiliki KTA Security. 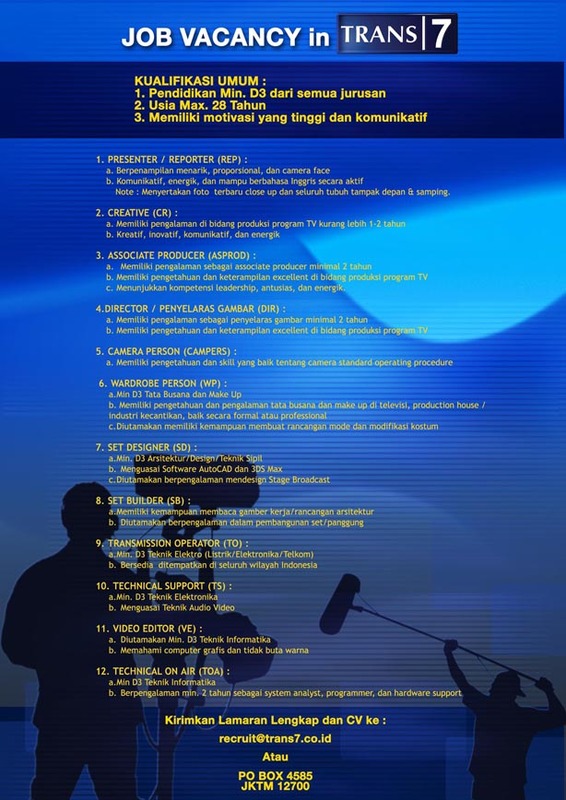 Menguasai operasional Komputer Ms. Office, Internet, Photoshop, Corel Draw dan Autocad. 4. Mengenal dengan baik wilayah Karesidenan Surakarta dan sekitarnya. 5. Berpengalaman sebagai driver minimal 1 tahun. 1. Pendidikan Min. D3 Teknik Sipil/Teknik Mesin/Teknik Elektro/ Teknik Kimia. 2. Kemampuan Bahasa Inggris aktif dan Komputer (Ms. Office, internet, autocad corel draw). 3. Berpengalaman di bidang General Affair min. 1 tahun. 4. Berpengalaman dalam pembangunan dan perawatan gedung, listrik, dan mesin produksi, dan bahan-bahan kimia di sebuah pabrik. b. Berpengalaman sebagai admin pergudangan min. 1 tahun. c. Mampu mengoperasikan komputer min. Ms. Office. d. Memahami spare part mesin jahit, peralatan listrik, dan alat-alat bangunan. b. Mampu mengoperasikan komputer minimal Ms. Office, autocad dan corel draw. Diutamakan mampu mengoperasikan mesin tenun dengan kecepatan tinggi. o Foto kopi Surat Keterangan Catatan Kepolisian (SKCK) yang masih berlaku. o Foto kopi ijasah SMA atau sederajad. o Surat Keterangan Kerja (bila ada). o Nomor telepon yang dapat di hubungi.